If you need an ecommerce, email marketing and affiliate program - it is great to have this all in one solution. Larger businesses with many employees in remote locations may need a different solution. If you do not need ecommerce or affiliate, you can use a lower cost program that costs less. The learning curve is short for a solo entrepreneur with some technical knowledge. We have recommended ecomdash to many people that sell on multiple channels. It is too advanced for stores that maybe only sell in two places, but once you get multiple channels going, we think it's the most comprehensive platform for the price. Email Marketing - Easy to use templates but you can also use your custom html template. Managing your list - It is easy to set up separate lists and create opt in forms for each one. It allows multiple opt in forms with customized messages for all steps of the opt in process. Ecommerce - Setup of your product or service is easy. You can use buy now type buttons on the 1ShoppingCart store. Integration with your merchant account or Paypal is offered. Includes an affiliate management option. This module allows you to manage an affiliate with custom links and an area to post materials for affiliates to use - such as banners. Multi-channel inventory sync: automatic depletion and restoration of inventory with sales and refunds, syncing back to all your channels. 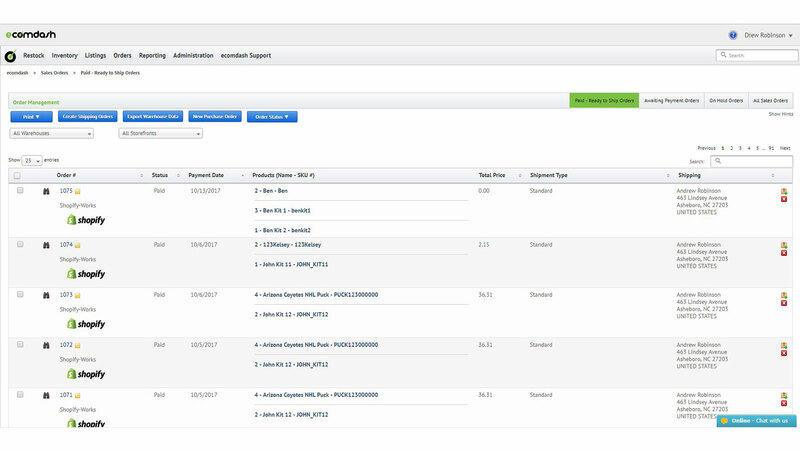 Sales order and purchase order management: keep track of things you buy and sell while simultaneously keeping your inventory accurate. Custom upload and export formats: you can make ecomdash work with almost any platform by creating your own formats to upload or export your data. I found their customer service team to be confusing with their responses and not as helpful as other products customer service teams. It can be frustrating to try to decipher their responses to more complicated questions and often felt a little 'annoying' whenever I needed to reach out. When creating newsletters, I found the WYSIWYG (what you see if what you get) version of creating newsletters the formatting was almost always off which always resulted in needing to send tests to myself to fix the formatting because it never showed up as it would look when it was sent. That took a lot of extra time to edit. Lots of different options with reports, as a beginner you may need someone else to support you. In the beginning I needed support from other team members in how to understand and create certain reports. Not the most intuitive and user friendly until you understand what you're doing! The platform is highly capable, which means it can also be confusing and there is a learning curve. Thankfully they have a pretty extensive knowledge base. They integrate natively with a select number of 3rd party services, but there are some notable large companies missing from the list that integrate with most other platforms. More integrations would be highly appreciated. Pricing is based on the volume of orders, with a fairly low threshold for the cheapest plan. I'd like to see more features added to the plans that cost more so you don't just feel like you're being charged for having more customers. If I were in charge of the renewal decision I would really take a look at 1SC vs. Infusionsoft. There are many ways each are great and many ways they are different. I would look at what was best for my company and make the choice accordingly. I find that Infusionsoft has many more ways to intuitively market, segment and cultivate new leads and grow the business as a whole than 1SC currently has. eComdash always answers our questions, and they have a call-back system to speak on the phone which is very convenient. The people there actually understand the complexities of the software and understand our problems when we explain them. Things get solved quickly and we feel like they care about the speed of the resolution. eComdash is more advanced and more customizable than the other platforms we've tried, and pricing is competitive. By reducing the overselling of products, we have saved time on customer service and inventory adjustments. Customer service at ecomdash is very helpful and knowledgable, which saves us time lost in learning things or fixing issues. Manage sales orders from multiple channels within the ecomdash platform.